This CLE program addresses key issues regarding compliance with the suitability rule. Panelists discuss key issues regarding compliance with the suitability rule. They provide practical advice on how firms and registered representatives can better understand customers and securities in order to comply with the suitability rule. They also discuss the intersection of suitability requirements with recent timely industry issues, such as senior customers, sales of complex products, IRA rollovers, concentration levels, online recommendations and share class considerations. Finally, panelists offer insights into FINRA examinations focused on suitability issues. Understand the main suitability obligations. Compare and contrast how broker-dealers with different business models are complying with suitability requirements. Enhance your compliance program based on recent examination experiences. Understand significant suitability issues that may impact your firm going forward. Discuss procedures and practices for complying with the rule. James S. Wrona is Vice President and Associate General Counsel for FINRA in Washington, DC. In this role, he is responsible for various policy initiatives, rule changes and litigation regarding the securities industry. Mr. Wrona formerly was associated with the law firm of K&L Gates LLP, where his practice focused on complex federal litigation. He also previously served as a federal law clerk for the Honorable A. Andrew Hauk of the United States District Court for the Central District of California (Los Angeles). Mr. Wrona is a frequent speaker at securities and litigation conferences and author of numerous law review articles, including The Best of Both Worlds: A Fact-Based Analysis of the Legal Obligations of Investment Advisers and Broker-Dealers and a Framework for Enhanced Investor Protection, 68 Bus. Law. 1 (Nov. 2012); The Securities Industry and the Internet: A Suitable Match 2001 Colum. Bus. L. Rev. 601 (2001). Norm Ashkenas is Senior Vice President, CCO for Fidelity Brokerage Services, running Broker/Dealer and Insurance compliance for Fidelity Investments’ retail and retirement business. He has been with Fidelity since 2003 in various compliance leadership roles, including field, product and regulatory, internal controls and ASL covering B/D, IA, ERISA/Tax and TA issues. He has also been CCO for Fidelity Distributors Corporation and Fidelity Personal Trust. Previously, Mr. Ashkenas spent 10 years with Prudential Securities as SVP for Regulatory & Compliance Examinations, and VP/Associate General Counsel. Prior to that, he was a litigation attorney with Chemical Bank. He is on the FINRA District 11 Committee and Membership Committee, has served on the Regulatory Advisory Committee, and is on the Board of Directors for NSCP and chair of the NSCP Broker/Dealer Committee. Mr. Ashkenas has spoken frequently at industry conferences such as the FINRA Annual Conference, SIFMA Compliance & Legal Division Annual Seminar and NSCP National & Regional Meetings. He earned a BA from Northwestern University and JD from Fordham Law School, and holds Series 7, 14, 24 & 63. Wendy Lanton has been working in the financial services industry for more than 20 years. She is one of the founding principals of Lantern Investments, a FINRA registered broker dealer, and Lantern Wealth Advisors, an SEC registered investment advisor. She has been the Chief Compliance Officer of Lantern Investments since its inception in 1993. The firm has multiple business lines and currently has 44 registered representatives and operates 13 branch offices across the country. Ms. Lanton is responsible for both the firm’s compliance and the day to day operations. In December 2015 she was appointed to the FINRA Small Firm Advisory Board. She also currently serves on the Steering Committee for her firm’s current clearing firm and was the co-chairperson on the steering committee at her previous clearing firm. As a steering committee member, her industry experience is called upon to help direct both compliance and technology resources. Ms. Lanton has also served as the chairperson for multiple Compliance Forums for retail brokerage firms. 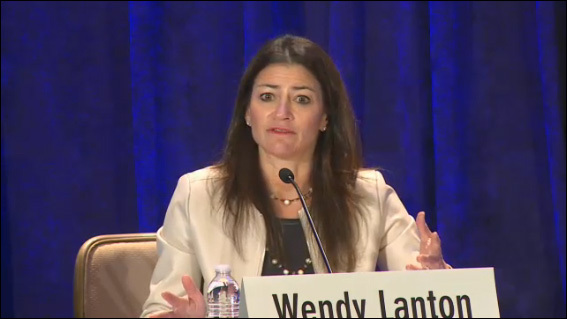 As a speaker/panelist at the FINRA 2014 Annual Conference her industry experience was called upon to discuss Anti-Money Laundering and Effective Risk-Based Examinations for small firms. She was also a speaker/panelist at the FINRA 2016 Annual Conference discussing Top Regulatory Concerns. In February 2016 Ms. Lanton served as a panelist representing small firms at the Cybersecurity Conference. She has written numerous compliance-centric articles focusing on topics ranging from client suitability to cyber-security. Ms. Lanton graduated from George Washington University where she majored in International Finance. Prior to becoming a founding member of Lantern Investments, she worked for a regional bank where she managed assets for high net worth individuals and medium sized businesses.